Note: This review contains images and video using the 2017 model. The 2019 TT8 model maintains the same specs. The difference between the two models is the organization of the console. However, the programs, motor, and other integral components of the TT8 are all the same as the 2017 model. The only functional difference between these two versions of the TT8 is the added USB port to the 2019 model. 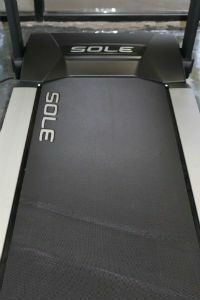 The Sole TT8 is a tough, light weight, commercial quality treadmill. 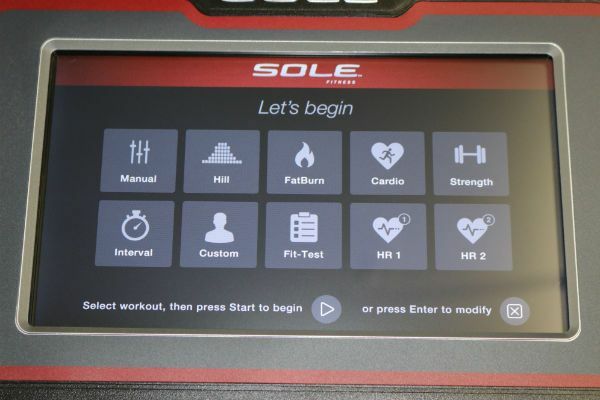 While it doesn’t have a fancy touchscreen other competitor treadmills have, the TT8 interface is clean and streamlined for easy use. With a 4.0 CHP motor, this treadmill is a good fit for walkers, joggers, and runners. It also comes with SOLE Fitness’ patented Cushion Flex Whisper Deck and can hold up to 400 lbs. 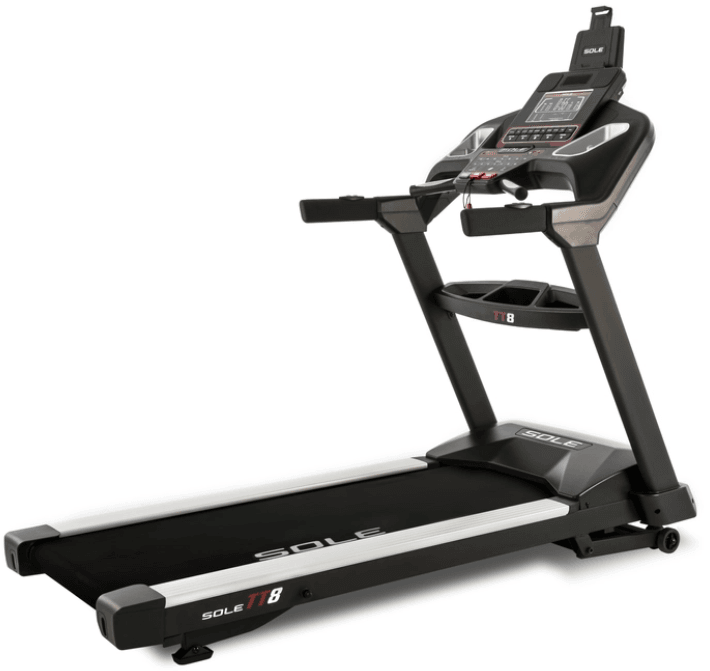 From its cushioned deck to the powerful motor, the TT8 is a great treadmill and has snagged our Best Buy Award for treadmills between $2,000 - $2,499. The TT8 is competitively priced at $2,499. Want a challenge. With the ability to decline to -6% and incline up to 15%, this treadmill provides a challenge for all levels of users. Like simplicity in their equipment. 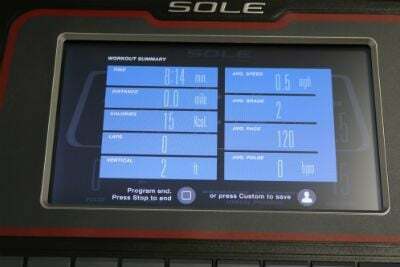 Like other Sole machines, this treadmill doesn’t have a touchscreen but instead has a crisp LCD console interface. So for users who don’t want all the bells and whistles many modern cardio machines have but still want a top quality machine, the TT8 is the treadmill for them. It is user-friendly for a wide range people - With the highest weight capacity of treadmills in this price range, up to 400 lbs, it can accommodate beginners easing back into exercise as comfortably as advanced users. Users can challenge themselves with the handful of pre-set programs or make up their own custom program easily with the TT8’s simple interface. Can use either the residential or light commercial warranty. The TT8 comes with both a residential warranty and a light commercial warranty, so this treadmill will suit either your home gym or the office gym. Motor Size - The motor in this treadmill is a 4.0 CHP motor, one of the most powerful ones available at this price range and larger than the competing Matrix TF30. With this more powerful motor, this machine is up for daily use by multiple users and can be expected to last for years under that kind of usage. 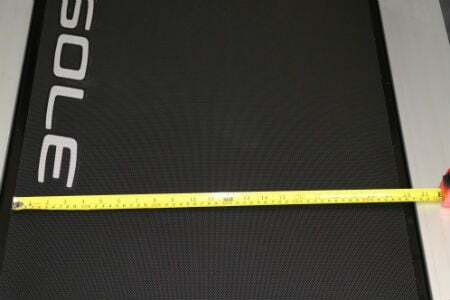 Running Surface - The running surface is 22” x 60”, which beats out the TF30 (20” x 55”) and is a match for the NordicTrack x11i. This larger surface area means taller runners will be comfortable using this machine and enjoy a bit more side room to accommodate larger users. Weight Capacity - Sole prides their machines for being incredibly sturdy and that shows in the weight capacity they can hold. The TT8 can hold up to 400 lbs, which is 100 lbs more than the x11i and 50 lbs more than the TF30 can hold. Folding - This treadmill does not fold. Part of the system that allows for a greater decline is not designed for foldability. If you want some decline and the ability to fold, NordicTrack Commercial 1750 can go to -3% and still fold. Space / Footprint - The TT8 is 35” wide, 82” long and 58” tall. As this treadmill doesn’t fold, be sure to carefully measure the space you plan to place this machine into; it won’t be comfortable to move much after you place it. Noise Level - Noise level base, 1, 6, 12 mph w fans on. Button sounds. Incline sounds. Max Speed - The treadmills max speed is 12 MPH, which is plenty of challenge for the average runner to take on. Especially when you pair your workout with incline, users will find keeping a jogging a pace at 15% incline to be the height of difficulty. 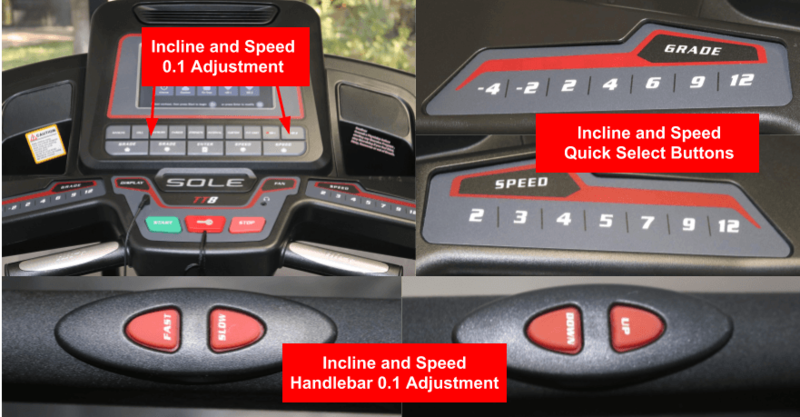 Incline - This treadmill has an incline range of -6% decline and up to 15% incline. While the x11i can out-do that with its massive 40% incline, the TT8 offers plenty of challenge for the average user to work in some hill training into their workout. Workout Apps - The TT8 omes with the same workout apps available on all Sole treadmills: 10 pre installed workout programs including manual, cardio, hill, strength, fatburn, interval, 2 customized user settings, and 2 heart rate targeted workouts. Additionally, the TT8 has a fit test option for monitoring your growth. Display - The TT8 has a 10.1” thin-film-transistor (TFT) LCD screen display, allowing users to track things like their calorie burn, time, speed, incline, and more. While the screen itself is not a touchscreen, the input buttons for the treadmill are very responsive. The 2018 model console has light graphics on a dark display which helps to keep you from straining your eyes. Speakers - 2 built-in speakers come with every TT8 treadmill, allowing users to enjoy their media without utilizing headphones. However, like many Sole treadmills, the speakers are only of decent quality, with minimal bass range, which makes some forms of media sound tinny at louder volume levels. Fans - There are two built-in console fans in the TT8, located at the top of the console. If you are a shorter user (under 5’3”), you may not have much of a breeze from these units. They are single speed and circulate enough air to keep joggers and walkers comfortable. Runners may need to employ another fan to keep cool. Heart Rate Monitoring - One of our few disappointments with the TT8 was the lack of a heart rate monitoring chest strap. The technology is available, but the chest strap is a separate purchase from the machine. 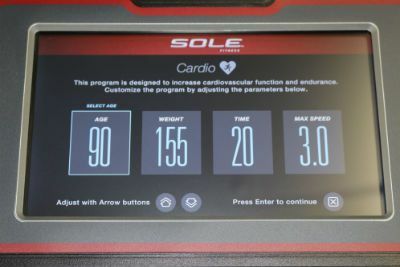 While competitor machines TF30 and x11i both include a heart rate monitoring chest strap with the purchase of the treadmill. It does come with heart rate handgrips but these are notoriously inaccurate in all brands of treadmill across the board. Extra Storage Space - The TT8 comes with 4 device/water bottle holders, with 1 larger central holder for whatever may not fit in the device pockets. Console jacks - There are two console jacks on the TT8. One allows you to plug your headphones directly into the console and the other is so you can plug your media into the console and play it through the treadmill’s speakers. The treadmill comes with an aux cord. 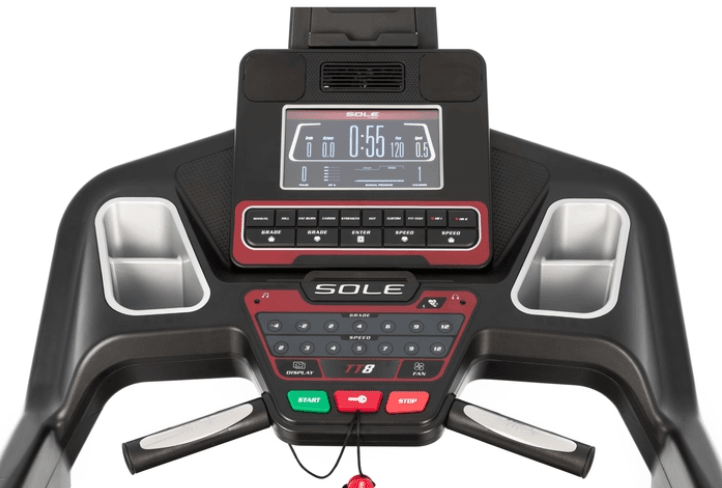 Speed & Incline arm buttons - Like many Sole treadmills, the TT8 has adjustment buttons on the arms of the treadmill, allowing users to quickly and easily change their speed and incline. Warranties - Lifetime warranty on frame, motor, deck, 5 years for electronics, 2 years on labor. Customer Support - Phone customer support is Mon-Fri, no weekends. Email support is 24/7. Sole Fitness prides itself on making “Bulletproof frames” and they have just cause to feel that way with the TT8. It is a heavy and sturdy machine, with metal side rails and a welded metal frame. The deck is comfortable with plenty of flexibility. Users who may be struggling with recovering from injuries can safely use this machine, as it negates much of the hard impact they would be experiencing with outdoor running. If these are things you are looking for, then this will be the treadmill for you. We recommend that potential users buy directly from the manufacturer, as you will save money and help you access to the latest model, which is what this review is based on. You’ll also have the least hassle of dealing with returns and customer service this way as well.